Review Questions for Computed Tomography is organised into three major parts--based on the content categories of the ARRT CT examination--and consisists of 400 multiple-choice questions. Part A covers Patient Care and includes 63 questions on: patient preparation, assessment and monitoring, IV procedures, contrast agents, and radiation safety. Part B deals with concepts relating to Imaging Procedures and includes 107 questions based on: anatomy and physiology, contrast media, scanning procedures, specials procedures of the head, neck, spine, chest, abdomen, pelvis and the musculoskeleletal systems. 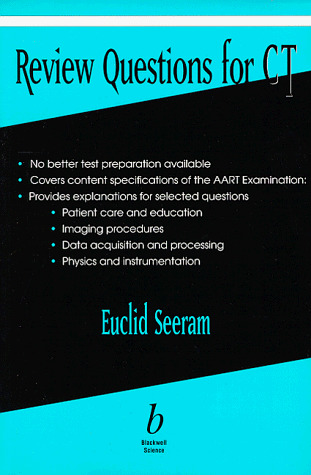 Finally Part C addresses the Physics and Instrumentation aspects of CT and it includes 230 questions on: system operation and components, image processing and display, image quality, and artefacts. Finally, the answers are provided at the end of each major part.